What Vitamins Do Men Need for Healthy Sperm? Can Zinc & Saw Palmetto Shrink the Prostate Gland? An enlarged prostate commonly affects men as they age. In fact, as many as 90 percent of men 85 and older have urinary problems because of an enlarged prostate, the University of Maryland Medical Center reports. You can treat the condition with medications or medical procedures, but if you want to try less-invasive techniques, you can try to change your diet or use herbs to get relief. A chemical compound found in plants called beta-sitosterol may help improve the urinary symptoms that develop in men with an enlarged prostate, the University of Maryland Medical Center reports. In addition to its effects on the prostate, beta-sitosterol may help lower cholesterol levels. 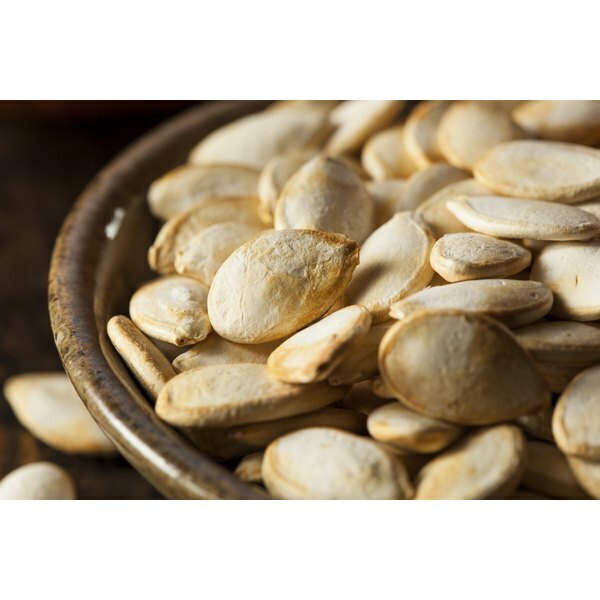 Foods with this chemical include pumpkin seeds, but you can also try dietary supplements to help treat the condition. However, make sure you consult with a doctor before using a dietary supplement. Eating a diet rich in zinc can also help men who suffer from an enlarged prostate, MayoClinic.com advises. If you want to try to boost your zinc intake, incorporate foods such as lean beef, duck, lamb, oysters, crab and baked beans into your diet. You can also try a multivitamin or dietary supplement to increase your zinc levels, but you should always check with a doctor first. You can also consider eating more vegetables containing vitamin C to help with an enlarged prostate. Good choices include bell peppers, snow peas, snap peas, broccoli, cauliflower, tomatoes, Brussels sprouts and kohlrabi. MayoClinic.com notes that while vitamin C from vegetables is associated with a lower risk of enlarged prostate, a high fruit intake is not. If you have an enlarged prostate, you should also consider cutting caffeinated drinks and foods from your diet. Caffeine acts like a diuretic in your body, which will increase your urine output. That means it could worsen the already bothersome symptoms you experience because of the enlarged prostate. For similar reasons, alcohol is best avoided. And if you do enjoy an occasional indulgence in coffee or an alcoholic drink, try to limit it to before dinner so the symptoms do not further interfere with your ability to sleep. Does Coffee Cause an Enlarged Prostate?